With my now three year old toddler constantly fighting for his independence, I have become well versed in toddler meltdowns. Over time, I have begun to see a pattern in the different stages of tantrums emerge; Stages that I've recently realized are very similar to the five stages of grief. 1. Denial- Toddler tantrums most always start with denial of some form. For me, the denial is him ignoring me, or staring at me with a look of shock and disbelief that I won't let him have his way, or just the good ol' go-to "NO!" flying out of his mouth while running away from me, my kid has denial down like a pro. 2. Anger- Once the denial stage is over, which usually happens when I finally catch him, ANGER sets in. This is the stage where a verbal assault is paired with launching toys across the room. When necessary, a dead drop to the ground is followed by flailing arms and legs to convey just how pissed off he is. 3. Bargaining- I can always tell things will get interesting when we get to the bargaining stage. He can get very creative at this stage. He thinks if he gives me options, then he can gain control of the situation. It usually plays out like this: Toddler: Fine! If I do XYZ, can I have a popsicle?" Me: No! This exchange will go on for a few minutes, until he realizes that I'm not giving in... though, sometimes I do give in to win a clean plate of veggies or a much overdue nap. 4. Depression- Depression is the most annoying of the stages. Depression ushers in the fake tears and moments of feeling like the worst parent. My son can pull off real tears and a super sad cry when he focuses his evil energy on it. Luckily, this stage usually ends when I finally give him my best, REALLY? Are you kidding me right now?, look. 5. Acceptance- This stage is the most vindictive. Once my toddler realizes that he's not going to get his way, he fakes acceptance just to throw me off his trail for his next evil genius plan...the one he was concocting when he knew he was going to lose the battle. 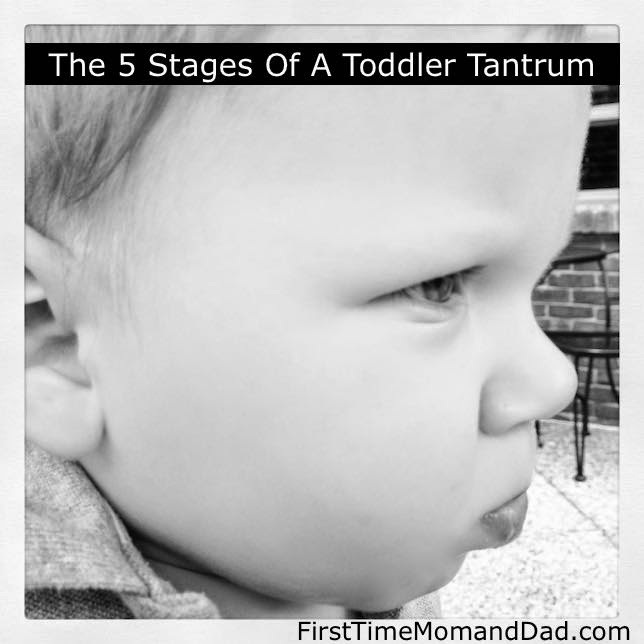 Does your toddler follow The 5 Stages Of Toddler Toddler Tantrums too?